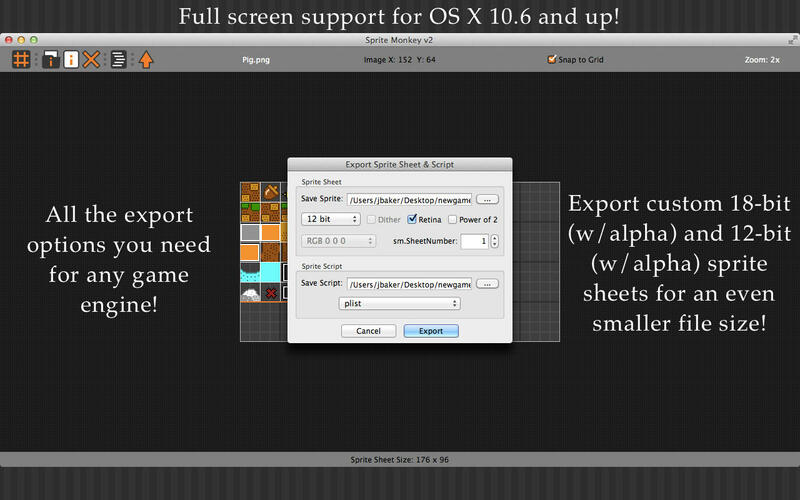 Sprite Monkey is the smallest and fastest sprite sheet editor without sacrificing features! Quickly edit your sprite sheet/strip, aka "texture atlas", in a simple uncluttered user interface. 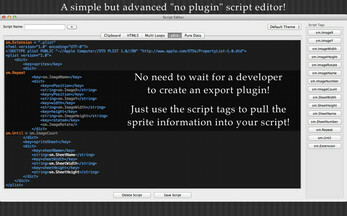 Easily create sprite coordinate scripts in the "no plugin" script editor for any game engine or programming language. Export custom PNG images not found in other editors for a smaller file size. Check out the feature list below! Load Image Folder – Import a folder of images. Images can be of various size and format. Sequence images load best when numbered. If your last image has double digits (MyImage25.png) then the first image should have double digits (MyImage01.png), else the images will not load in order or load alphabetically. Import Image – Import a single image. If you already have images loaded, this image will be put at the end of the list. Delete Image – Deletes an image. Image id's will be automatically recalculated and put back in numerical order. Drag & Drop – Drag and drop a folder of images, an image or even a Sprite Monkey Project file! Multi-Select/Drag – Select multiple images and drag them. Rotate Image – Right click on an image to rotate it -90 degrees. Reset Columns – Set column/sheet width by selecting an image and using "command + R" keys. If you want to add another column after using "command + R", just move the top-right image to the right a bit and use "command + R" again. 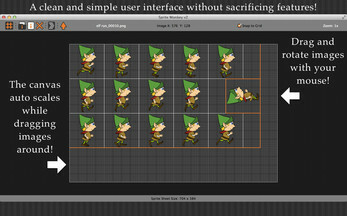 Quick Sprite Strip – When images are initially loaded, they are laid out in a sprite sheet format. You can quickly change them to a sprite strip by using the "command + T" keys. Clip Alpha Image – Clip 32bit images by using the "-" and "+" (Shift + on a compact keyboard) keys so you can overlap the images. This evenly clips the width (or height if rotated) of all the images, so it doesn't interfere with the animation sequence. You can use the "command + R" keys to collapse the images to their new clip size. 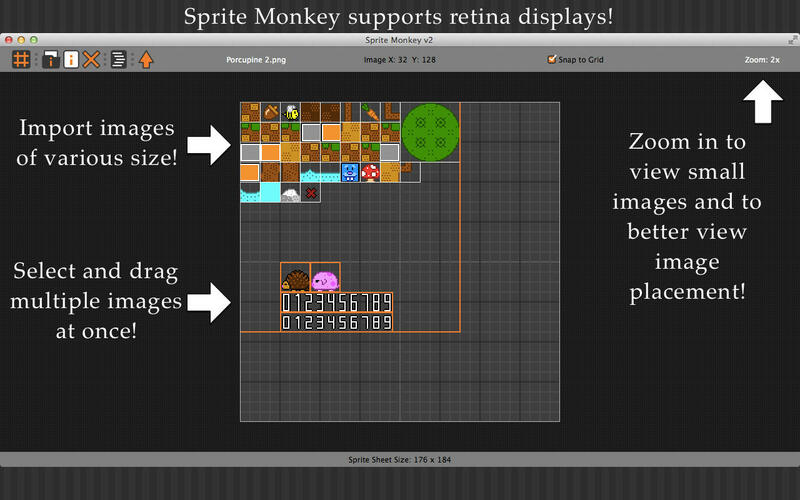 Retina Mode – Edit your @2X sprite sheets at normal size. Looks best on a retina display, of course. Export custom PNG formats: 12-bit w/alpha, 18-bit w/alpha for reduced file size and Alpha Channel that can be used to create special effects. Also exports the normal 32-bit, 24-bit, 8-bit, 4-bit and 1-bit PNG images. Realtime Information – All sprite sheet information is displayed and updated instantly as you drag your images on the canvas. Displays the image name of the selected image, coordinates of the selected image, sprite sheet width and height, visual sprite sheet border and zoom level. Auto Scaling Canvas – The canvas is reduced to the width and height of the image layout and auto scales if needed when moving images around. Canvas Zoom – The canvas can be zoomed up to 4x its normal resolution. This can come in handy for pixel artist who may create small retro style graphics. Multi-Grid Canvas – Three grid colors are set by 8, 32 and 128 pixels for easy image placement. Script Editor – The "no plugin" script editor allows you to easily create and export sprite coordinate scripts for any game engine or programming language such as Xcode, HTML5, Cocos2d, PureBasic, etc. Preferences – Allows you to set and save regularly used settings. Save your work to a Sprite Monkey Project file. All your images and current progress are saved into a compressed "*.smpf" file. 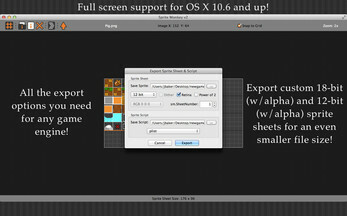 Full screen support for OS X 10.6 and up. Yes, even OS X 10.6 has full screen support! There's also a help file and example sprite coordinate scripts to get you started.